On Sunday we went to another Tired Dog Good Dog lure coursing event. It was absolutely marvelous, Brisbane got to run to his heart's content. He might even be starting to settle a little bit at events as he gets to run until he is well and truly tired. This time he overdid it a little, and hurt his feet. See that flap of skin? Around the time the batteries were running down, we noticed Brisbane was limping. 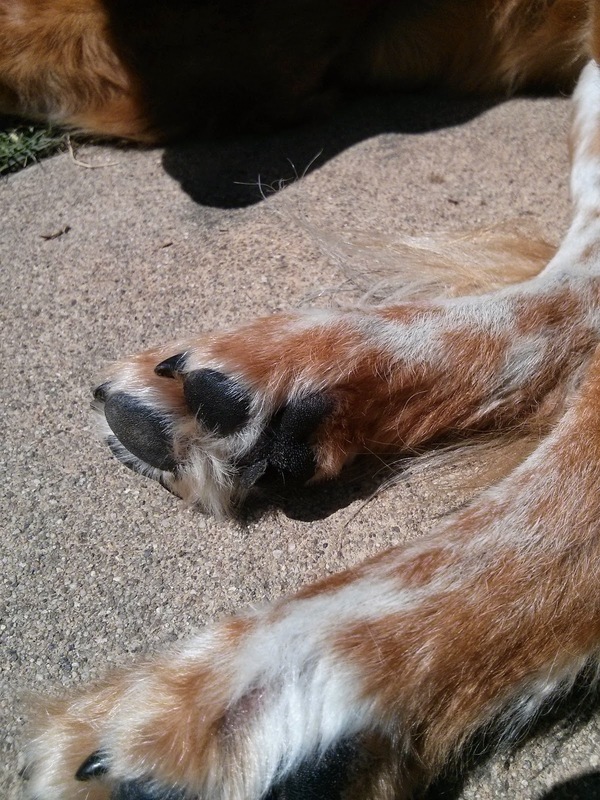 I checked his feet, and found that each paw pad had a flap of skin peeled off the bottom. Some people call this a "slipped pad", it's basically a friction injury. Dogs can also get this same peeling effect from walking on hot ground. Brisbane's foot injuries are only mild, if it were worse he could have lost all the tough skin on the bottom of his feet. Some people would take their dog to the vet for this type of injury, but I am comfortable treating it at home. Since it is only the outer layer of skin, I've left it alone and let Brisbane rest. Holding him down and cutting the flaps of skin off wouldn't help him heal faster. There is no exposed pink flesh, and the wounds are dry, so I've left them unbandaged. If the yard were wet or muddy I might bandage them, but I think we're all happier this way. I have limited Brisbane's activity while he heals, no rowdy games, no walks, and no unlimited access to the outdoors. He has had a few low-dose aspirin, but not too much because he is more likely to limit his own activity if he hurts a little bit. So totally worth it! Photo by Pawz in Action.